Wednesday Wrap: Yamaha DTS:X and HDR, SoundCloud radio, Linn Kazoo update and more | What Hi-Fi? From the news that Spotify wants to raise $500m to take its total funding in 12 months to $1bn, to the RIAA announcing streaming figures will contribute to an album's accreditation and Bang & Olufsen releasing an app to let you virtually place its products in your room - it's What Hi-Fi? 's Wednesday Wrap. Yamaha has revealed it will be rolling out a firmware update for selected AV receivers and soundbars, bringing support for HDR and DTS:X. 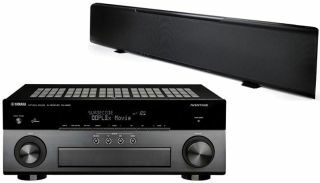 The AVRs that will benefit from both HDR and DTS:X are the RX-A1050, RX-A2050, RX-A3050 and CX-A5100, while the YSP-5600 Dolby Atmos soundbar will now support DTS:X too. Some mid-range receivers will be updated to support HDR as well, and these include the RX-V679, RX-V779 and RX-A850. If your eligible Yamaha product is connected to your network you’ll be prompted to update to the latest firmware when it rolls out in spring 2016. If it isn’t networked then you can follow instructions on Yamaha’s website to update it manually. If you were hoping to put one of Bang & Olufsen’s products somewhere around your home, but weren’t sure if it would work best in a corner or on a wall, fret not, B&O has created the BeoHome Design App. Using the app you can point your iPad camera at an area of your room and, as if by magic, the B&O product will appear in your camera's view, giving you an idea of how the product would look. Linn's Kazoo app is now available for iOS and Android devices. You can use the app to browse and stream music stored on NAS drives and servers, as well as use integrated music streaming services including TuneIn and Qobuz. Linn is offering a 90-day free trial of Tidal for any Linn DS owners that download the mobile app. The app is now available now for iPhone, iPad, Android, Windows and Mac. All relevant links are available on Linn's website. SoundCloud has updated its iOS app to include a new ‘station’ feature, which lets you create a non-stop radio style playlist of songs based on your listening habits, likes and other data. If you want to create your own station, simply select a song you like, choose the three dot option menu and press ‘start station’. Stations you’ve listened to will be easily accessible in a ‘recent stations’ tab. It's only on the SoundCloud iOS app for now. Streaming figures will now contribute towards Platinum (1m sales) and Gold (500,000 sales) album accreditations in the US. The Recording Industry Association of America (RIAA) has said 1500 audio or video streams of a song will equate to one physical album sale, while 10 digital song sales will count as one album sale. This includes Spotify, YouTube and more. Some albums have already benefitted from the new method, including Alt-J’s An Awesome Wave, which has gone gold. Coldplay’s Ghost Stories has now gone platinum. The RIAA already had a similar system in place for recognising a single’s achievements, and now it applies to albums too. Spotify is looking to raise $500m, less than a year after it secured $526m from 13 partners three weeks before the launch of Apple Music. The news comes from Swedish newspaper Svenska Dagbladet, which says Spotify will aim to generate the funding from convertible loan rates. The streaming service says it will pay 4 per cent interest on the loans from investors, and will give them a 17.5 per cent discount on its shares if it pulls off a successful IPO (Initial Public Offering) within a year.